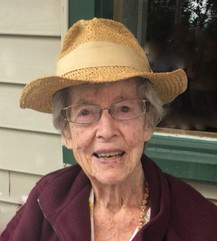 Phyllis Ann Tufts (nee: Craig) passed away peacefully on Friday, January 25, 2019 at the age of 100 years old. Phyllis, a daughter of the Prairies, was born in a farm house in Langdon, Alberta. She moved to Calgary early in life, where she lived until her death. Her love of the southern Alberta was evident in her love of hiking, cross-country skiing, and the Ghost Lake cabin. Mom's greatest love was her family. Her five children, four step-children, and all the grandchildren and great-grandchildren brought her joy and happiness. Phyllis enjoyed a large circle of friends and had an active social life, enjoying many moments of love and laughter. She was predeceased by her parents, Charles and Ruth Craig; brothers, Aaron and Harris Craig; sister, Irene Craig; her first husband, Dr. Noel Smith; and her second husband, Dale Tufts. Phyllis is survived by her five children, Patricia Wiltshire, Brian Smith (Clara), Ann Smith, Niall Smith, and Kevin Smith. She is also survived by her step-children, Marina (Cos), Kurt (Nell), Robin (Patty), and Tim (Les) Tufts; as well as numerous grandchildren and great-grandchildren. At her request, a private family cremation has been held. A funeral service and interment will take place in the spring, the date to be announced later. The family wishes to thank all the caregivers at Revera Scenic Acres whose kindness and compassion are greatly appreciated.